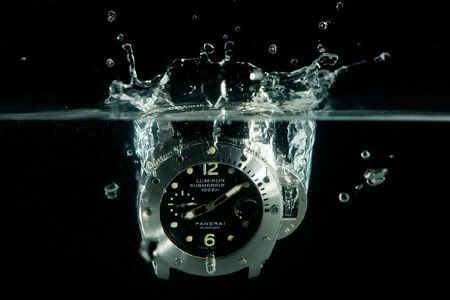 Martin, Paneristi and moderator of the Dutch Panerai Forum, started a blog on watches (Panerai mainly) and watch photography, http://www.wristwatchphoto.com?Ç¬The pictures he shows on the various forums are always fabulous, like the picture of the Panerain Submersible (PAM243) below. To be able to take this shot, Martin had to set the shutter speed of his camera to 1/100th, using two speedlights wrapped into plastic to protect them for the splashing Submersible. Ofcourse, the camera was mounted on a tripod for a steady shot. To read more about this particular shot and how it was done, please click this link.